Fred Korematsu was a citizen born in the U.S. to Japanese immigrants. Growing up, he felt thoroughly American, but faced growing bias and anti-Japanese sentiment in pre-WWII Oakland, California. When the Japanese Empire bombed Pearl Harbor, Fred and his community were forced to abandon their homes, businesses, and lives and report to internment camps. Fred Korematsu resisted the order and was later arrested and convicted of the crime of disobedience, a conviction he fought all the way to the Supreme Court. Although he lost this historic court battle, 40 years later, armed with evidence that federal prosecutors had lied during his court hearing, Fred Korematsu took up the fight again. 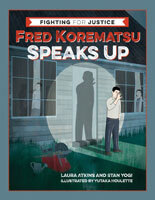 Fred Korematsu Speaks Up is an illustrated middle-grade biography that sold out its first printing in just two weeks. The biography is told in compact verse and interspersed with metanarrative sections that gloss terms, add biographical detail, elaborate concepts, and provide additional historical context. 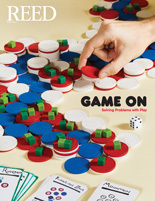 The authors extend the themes of the book by inviting young people to apply what happened in the past to their own lives, including tips that give young people pointers about how to speak out.